Now let’s be clear, if this makes these girls happy, then I am very happy for them, but this is not something that I want for myself. I wouldn’t say that I am anti-marriage, but I would say without hesitation that I am anti-ridiculous-and-unnecessarily-extravagant-weddings. As of 2009 the average amount spent on a wedding was $28,082.00*. That is a tremendous amount of money, planning, and effort all focused on a one-day-long celebration. 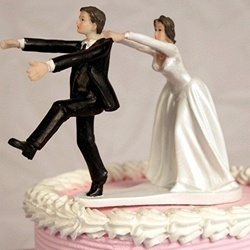 It would seem to me that after such a huge, amazing celebration, actual married life would seem awfully anti-climactic. In my mind, a day of extreme happiness and celebration followed by a lifetime of mediocrity is certainly not a recipe for a happy, healthy relationship. It seems logically that a relationship following this sort of pattern is structurally flawed and that perhaps a solution would be to de-emphasize the wedding and instead emphasize adventure and celebration spread throughout the entirety of the marriage. Do you know how many adventures you can go on with $30,000? A lot. And in my experience, adventure, excitement, and sharing new experiences are all crucial to maintaining a happy and healthy relationship. I readily concede that in many ways I am not a traditional girl, but trust that if I fell head-over-heels to the point where I was considering marriage, the LAST thing on my mind would be place cards and table linens. * Jaeger, Chris. “Wedding Industry Statistics.” Editorial. American Wedding Study. Bride Magazine, 5 July 2011. Web. 8 Feb. 2012. http://weddingindustrystatistics.com/. 30.000 dollars on a wedding? I agree, I can think of many more interesting things to do with the money! My gosh, I could go travelling for years, do an entire course in college or.. too many ideas! If I would ever get married it would be a low budget wedding, with a good party and only my closest friends. Thanks for your comment 🙂 I agree- it would be so much more intimate and less stressful that way. Bravo!! I have always felt this way, but never expressed it as well as you have here. What is it that makes couples agonize over every detail of that day and then think they aren’t supposed to invest time and effort into their relationship? Somehow, a lifetime of happiness and mutual satisfaction is just supposed to happen? Focus on the marriage, it’s your LIFE you are talking about, and screw the pretty napkins, unless you have the time and energy (and money) to focus on both. If that is truly the case, then bring on the flock of doves and the little bottles of bubbles with your names on them, just don’t become a divorce statistic before sheen wears off you Tiffany wedding bands. hahaha, if I could marry this comment, I would. Thank God. There is a woman in the world with enough common sense to realize this. I wouldn’t mind getting married again but, Geez, even in their 50’s women seem to want to spend our combined yearly incomes on it. Personally, I’ve had enough debt to hold me and I don’t se the purpose for the waste of resources. It’s would make our lives worse, not better. I have great respect for writers who have mastered the art of the title; you, dear lady, are one of those gifted few who “get it”! Great – and accurate – title!